The importance of managing risks in your software projects need not be further emphasized. Even if you're not working on safety critical products, risks have the potential to fundamentally derail your projects. With safety critical projects however, it is even more obvious that risks mean a serious threat not only to your project's success, but also to your company's reputation. At the very least, implementing adequate risk management could help cut your overhead costs. Considering that more and more companies are transitioning to an Agile methodology to deliver complex products, however, risk management is becoming more of an issue. While a single Agile team may successfully cover and mitigate its risks using simple methods, large enterprises that scale Agile using SAFe® face the challenge of also scaling their risk management. There doesn't seem to be a silver bullet solution to scaling your risk management across the three levels introduced by Scaled Agile Framework (SAFe®): the Team, Program, and Portfolio levels. However, categorizing your risks helps treat them adequately. Whichever level you're looking at, one widely used tool in scaling risk management under SAFe® is the ROAM board. It is used during PI planning to identify and analyze risks and issues. 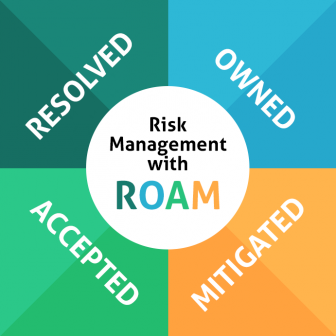 To make sure all the risks are covered, the goal of this technique is to Resolve, Own, Accept (by the product management team) or Mitigate all risks (hence the acronym ROAM). Potential issues that are solved on the Team-level ROAM board don't get transferred onto the Program-level ROAM board. The mitigation of the identified risks can follow a course similar to that of any Agile project. The main benefit of using a ROAM board is that it helps ensure that all the risks are covered – after a ROAM session, you should get commitment to resolve all the identified issues one way or the other. Another benefit is that ROAMing can be simply moved to a collaborative online tool, facilitating cooperation between geographically distributed teams. Collaboration is key in risk management: identifying potential risks is supported by the cumulative experience of your team members, and having your risks in a single tool helps ensure total risk coverage. Using a tool that simultaneously supports implementing SAFe® across your organization and scaling your risk management efforts provides an advantage. What's more, it could help ensure complete traceability of risks & ensure their coverage. codeBeamer ALM is not only the first proven implementation of SAFe®, it also comes with advanced risk management functionality. The Kanban board in codeBeamer is a flexibly customizable tool that you can easily use to conduct ROAM sessions. Risk trackers help you ensure complete traceability and risk coverage – after ROAMing your risks, you can simply assign mitigation tasks and trace these through to testing & release. Risk Matrix Diagrams support your risk mitigation efforts and ROAM, facilitating the acceptance of risks below a certain tolerable level by visualizing your risks. Thus, using a SAFe®-ready ALM to manage all your development processes helps you scale risk management, while offering all the benefits associated with using a single-repository, end-to-end ALM solution. To learn more, reach out to us with your questions, or simply start your free trial of codeBeamer ALM today!